In this article, I will tell you why and how to sync your cloud drive. With the help of free app - MultCloud, things become easier than before. Today, our work and life can’t leave computers. We create many documents, download videos and movies, take photos and store them in the hard disk. With the time flies, our hard drives become smaller and smaller. Luckily, with the development of computer technology, cloud drive comes! It is cloud computing era now. Although our local disks are full, we may save our data to cloud. The greatest advantage of cloud drive is that we can visit our data everywhere through Internet. Not only computer can connect to Internet, but also mobile devices, such as mobile phone, pad, handhold game player and so on. Thanks to WIFI, we can surf online in any corner. Nowadays, the trend is mobile Internet. There is more than one cloud in the world. Many companies provide cloud services. For example: Microsoft’s OneDrive, formerly known as SkyDrive. Amazon S3 and Amazon Cloud Drive, Google Drive, Dropbox, Box, MEGA, SugarSync, etc. Almost all cloud companies developed clients or apps. We sync clouds because we store data in A cloud but want to backup/copy to B cloud. Take an example, I personally prefer to use Google Drive(with a Google Drive account, I can login all Google services), while my company policy requires us to use OneDrive, which has a public account for us. Sometimes, I want to transfer files from my Google Drive to OneDrive, that’s why we need to sync Google Drive and OneDrive. As I said above, the simplest definition of a cloud sync is an exact copy. Copying original files from Google Drive to another, thus we have the data saved in two places. Usually, we have no official tool to sync two clouds of different providers. Sync has many advantages. First of all, we can achieve our data in more ways. When we can’t enter A cloud(forget password or the service is during maintenance), we can get our data by entering B cloud because we have synced before. Our product - MultCloud, can help you do cloud sync. 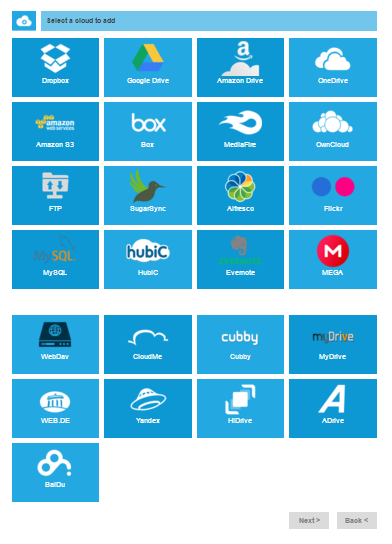 MultCloud is free to start. As its name suggests, a multiple cloud storage manager, it supports more than 20 clouds, most of them are cloud drives, others are FTP/SFTP, WebDav and so on. It is worth mentioning a more-integrated cloud program called Evernote; a professional photo editing online tool - Flickr, are supported by MultCloud too. MultCloud is a web app but now release a Chrome extension, which lets you easily use MultCloud and Google Drive. How to sync cloud drive via MultCloud? At first, I have to say the following tutorial is focus on MultCloud’s main body, if you want to try the extension app, please click here. MultCloud is an app based on website, of course, the first step is visiting its official site: www.multcloud.com. Then you decide to create an account or experience without signing up. For people who choose the latter way, you can enter MultCloud immediately as well as getting default username&password provided by MultCloud. What’s more, you are able to change username&password and bind your email address whenever you want. After signing in MultCloud, the second step is choosing a cloud to add. Different clouds need different information. For those clouds support OAuth, we don’t need to input username and password, just a display name. The final authorization process will be completed in the cloud’s official page. Next is the key step. Under File Manager interface, we can manage files in cloud like in Windows explorer. 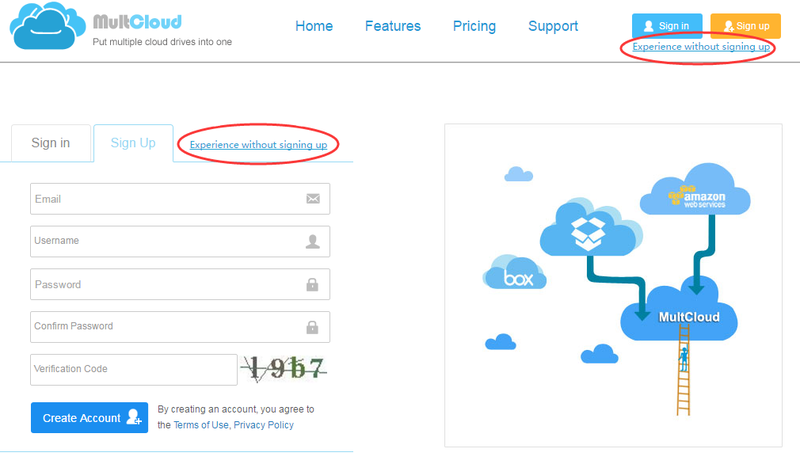 Before syncing, we suggest you to refresh the content in your cloud by clicking the refresh icon. Moving from Google Drive to another has many methods. “Copy” or ”Copy to” from contextmenu; direct drag&drop. All clouds in MultCloud can be synced. Simple Sync: In the source directory to add, modify, and delete will be reflected to the target directory, but in the target directory to add, modify, and delete the source directory would not be affected. Mirror Sync: Always keep the target directory in the file and the source directory is exactly (MultCloud will delete unnecessary files in the target directory). Move Sync: After the complete synchronization, delete all the files in the source directory. When the source directory file deletion, dont delete the corresponding files in the target directory. Cumulative Sync:When the source directory file deletion, dont delete the corresponding files in the target directory. Update Sync: Delete all files in the target directory first, then will increase in the source directory and modify the file transfer to the target directory. Incremental Backup Sync: In every time synchronization, will create a new subdirectory in the target directory, so that the new and modified in the source directory file transfer to the subdirectory. 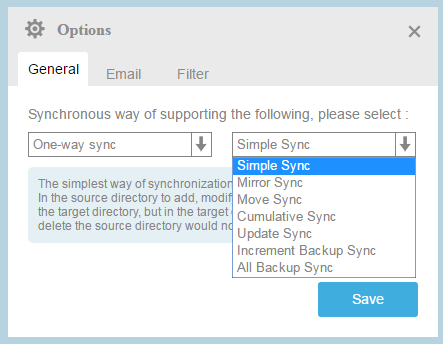 All Backup Sync: In every time synchronization, will create a new subdirectory in the target directory, so that all the source directory file transfer to the subdirectory. *Note: Above seven methods are One-way Sync. Two-way Sync: In the source directory to add, modify, and delete will be reflected to the target directory, at the same time in the target directory to add, modify, and delete will be reflected in the source directory (also is the beginning and keep the files in the source directory and the target directory). Other options are filter, overwritten, email notification and so on. Then you can choose sync now or schedule later. If you choose the latter, the task will be committed according to your preset time, which means sync automatically. What&apos;s more, once you setted a sync task, you can commit it again from the task manager. Or re-edit, delete, view logs, etc. Don’t worry about safety when using MultCloud to help you sync cloud. MultCloud does not save or record your data. In addition, MultCloud has no storage, it costs traffic when transferring. You can obtain up to 10 traffic, just share MultCloud on your SNS. MultCloud realizes multi-server parallel transmission, you can add more tasks and check tasks from the Task Manager. At last, MultCloud applies the high 256-bit AES Encryption for SSL, so feel free to use MultCloud to sync you cloud drive. Transfer files in cloud drives, FTP and WebDav for easily file management and information delivery. Sync two clouds or directories in two clouds through two-way sync or one-way sync. Combine multiple cloud storages into one and manage them like in Windows explorer.